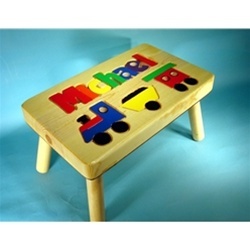 Help your little one reach for a bit of independence and learn to spell his or her name too with this personalized name puzzle train step stool for kids. 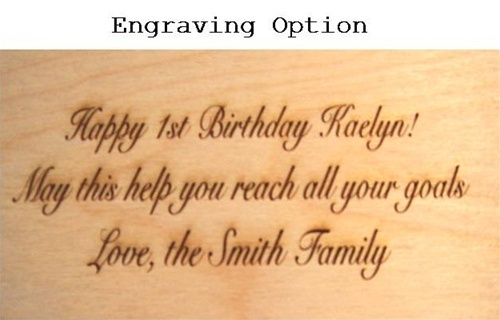 Each letter is brightly colored with non-toxic paint and has smooth easy to fit edges. Made in the USA crafted with furniture grade birch veneer and non-toxic paint. These stools are 8 inches high, 9 inches wide and 12 to 18 inches in length depending on the letters in the name, up to 12 letters. 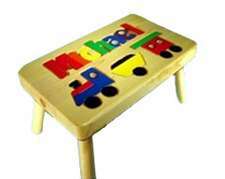 This train step stool for kids comes with 3 train puzzle pieces under the name. Single name only, for double names please order one of our double name stools. Also available in white. Included is a complimentary gift card. 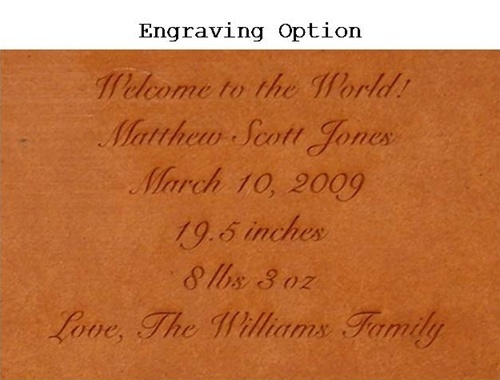 We can also send the message to the recipient via email to let them know that you have ordered a lovely personalized name puzzle step stool for them. Looked like a pencil mark went thru and the 2 L’s i thought should have had a slight space between them decided not to return it you do do nice work. Ordered the puzzle stool for our grand nephew. It came as ordered and quicker than expected. Puzzle Stools are fabulous gifts! Wonderful product. It came a lot faster than I had expected. It is our second stool. They are so cute and sturdy.